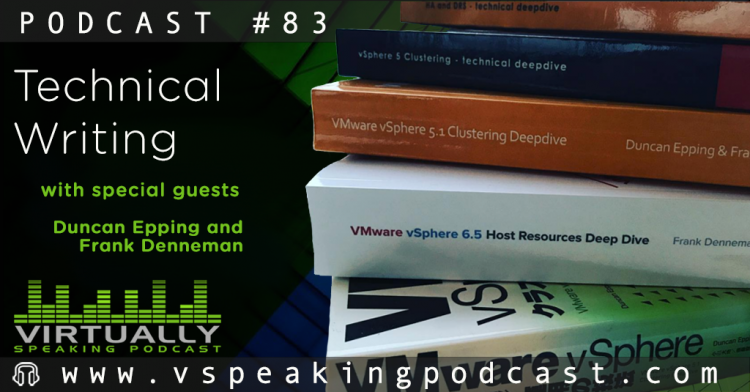 Last week Duncan and I were guests on the ever popular Virtually Speaking Podcast. In this show we discussed the difference in technical writing, i.e., writing a blog post versus writing a book. We spoke a lot about the challenges of writing a book and the importance of a supporting cast. We received a lot of great feedback on social media, and Pete told me the episode was downloaded more than a 1000 times in the first 24 hours. I think this is especially impressive as he published the podcast on a Saturday Afternoon. Due to this popularity, I thought it might be cool to share the episode in case you missed the announcement. Pete and John shared the links to our VMworld sessions on this page. During the show, I mentioned the VMworld session of Katarina Wagnerova and Mark Brookfield. If you go to VMworld, I would recommend attending this session. It’s always interesting to hear people talk about how they designed an environment and dealt with problems in a very isolated place on earth. Enjoy listening to the show.